If not managed properly the above agents can reduce the value of your woodlot in a short time. Breaking the list into two categories may help us better understand the protection required to minimize the exposure. The category Resource Protection will discuss ways to minimize the exposure of the resources on the woodlot. The second category, Financial Protection, will discuss ways to minimize the exposure of the woodlot owner's financial resources. The risk of a major fire can be lessened by reducing the amount of fuel. Fire is by far the most aggressive threat to our woodlots; however, with some consideration and planning you can reduce your woodlot's risk of fire. Fire requires oxygen and fuel to burn. By removing fuels such as dead and diseased trees, a woodlot owner can reduce the chance of fire breaking out. Fine fuels such as branches and tree tops will ignite very quickly if a spark touches them. The healthier the woodlot, the less the chance of fire. At certain times of the year, when dry conditions exist, the fire hazard in the forest is high. Limiting access to the woodlot and rescheduling activities to another time of year will reduce the chance of fire. The Department of Natural Resources can give you an up-to-date report on the fire hazard. Harvesting forest products during the dry, warm months can create a dangerous fire hazard. Machinery can come in contact with stone and rocks, generating sparks which can come in contact with stone and rocks, generating sparks which can cause a fire. As well, harvesting operations leave a lot of fine fuels in the form of slash (tops of trees and branches). This fine fuel dries out very quickly in the warm breezes of summer and can be ignited by a small spark. Firefighting equipment is vital during the fire season. Using machines equipped with fire extinguishers will allow the operator to quickly extinguish a small fire. Back tanks or larger machine tanks at the site will give the machine operator an available source of water in case of an emergency. As well, removing slash from the sides of roads will reduce the amount of fuel available to ignite a fire if a careless traveler throws a match or cigarette on your woodlot. Silviculture activities can increase the chance of fire, as many silviculture activities are labor intensive and require many workers in the woods. Certain treatments require the use of spacing saws and chain saws which when hitting a rock will create a spark. Again by having the appropriate fire equipment on site, such as a water tank, shovels, and small fire extinguishers, the risk of fire can be reduced. Care must also be taken during the fire season when using the woodlot for recreation. Open fires should be eliminated and smoking should only be done when sitting down in a place where a cigarette can be properly extinguished. If a fire does break out, quick access to a water supply will allow the fire to be extinguished while it is small and manageable. Some woodlot owners are fortunate enough to have a lake or a natural pond located on the property. A well constructed firepond can provide quick access to water. If a natural water source is not present, a forest pond should be constructed. A pond should be accessed by road, and capable of holding water during the dry season of summer. Fire breaks are only recommended in situations where a fire hazard is identified. An example of fire hazards are blueberry fields, which require frequent burning, or a populated area where there is a chance of grass fires. Fire breaks can be used to prevent fires form spreading through your woodlot. A fire break is generally created by using a bulldozer or excavator creating a continuous area of mineral soil or ditch around the edge of the area to be protected. The dozer or excavator will eliminate all fuels such as brush, stumps and organic material. Although not easily found, fire insurance is available for timber, Christmas trees and other resources pending circumstances. Premiums are calculated as a percentage of the resource value. This type of insurance is found in specialty markets and may require an insurance broker to locate it. Disease and insects can be present on your woodlot without causing damage. Only when their populations explode will damage be noticed. Some of the results of disease and insects include downgrading timber quality, reduction in tree growth, and mortality. Outbreaks of disease and insects decrease the value of many resources on the woodlot. High insect populations may cause severe damage. You can learn about the disease and insects are present in your area by visiting your local Department of Natural Resources' office. It is also a good idea to walk or have a forestry professional walk the woodlot annually to identify any disease or insect problems. The department of Natural Resources monitors the provincial forests through insect surveys. When significant increases in the populations of disease and insects are detected the public is notified. To prevent a large outbreak of disease or insects in your woodlot, it is helpful to diversify the woodlot's species. Having a variety of species and age classes will reduce the chance of a significant outbreak that will wipe out your entire woodlot. For example, the spruce budworm will only feed on softwood, especially balsam fir. By introducing a mixture of pine, hardwood, hemlock, and spruce to the woodlot, there is less of a risk of losing all your trees in an outbreak. Diverse stands of varying age classes and species will reduce the risk of insect or disease outbreak. This concept of diversification is similar to the way one would be encouraged by a financial advisor to diversify your RRSP portfolio. By putting some of your savings in short term deposits, such as GIC's, some in longer term bonds or mortgage funds, and some in equities, you reduce the chance of taking a big loss if there is a down turn in part of the market. As with fire protection, keeping your woodlot vibrant and healthy is one of the best ways to control disease and insects. Insects and diseases are attracted to weaker trees which are less able to withstand an outbreak of disease and insects than healthy trees. If an isolated population of disease or insects is identified on your woodlot, it may be best to harvest the infected trees. The residual slash can then be burned or buried to prevent further spread of the disease or insect. This technique is used in the management of Dutch elm disease, serrococcus in red pines, bark beetle, mistletoe, etc. Time is critical in this technique, with quick identification of the problem and fast removal of infected debris to prevent the spread of pests. Bird houses can attract beneficial birds to control insects. Encouraging beneficial insects and birds on your woodlot is another way of reducing insect problems. Species of birds and beneficial insects will feed on more harmful insects. By promoting beneficial birds and insects, a woodlot owner is less likely to have insect problems. The Christmas tree industry in Nova Scotia has been using this technique to control insects. Example are the construction of bird houses to encourage birds that will reduce insect populations. And the introduction of lady bugs, which eat aphids that damage Christmas trees in the spring on the year. Insecticides and fungicides will prevent or control insects and diseases. Although readily available, the cost of both the pesticide and the application can be very high. In an extreme outbreak, the Department of Natural Resources may implement a provincial or regional protection program. As a woodlot owner, you may become involved in this program. 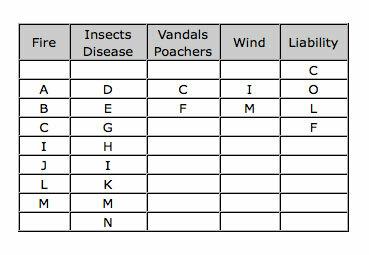 The Christmas Tree Council of Nova Scotia has a chart showing the best times to sample for each insect. As in any management system, keeping records of insect and disease populations and documenting practices that you have successfully used, will provide a valuable history for future use. Information such as the time of year the insect or disease emerged, treatment, the conditions of the season are all important facts that can be used to prevent damage from insects or diseases. Records can also help to forecast potential insects to watch for in the future. There are many techniques that can be used to keep a woodlot healthy. No one technique will do the job successfully and consistently. Woodlot owners should develop an Integrated Pest Management strategy for their woodlots which incorporates many of the techniques discussed above. You may want to seek advice from a forestry professional when developing your approach. Vegetation can compete with trees for light, water and nutrients on the woodlot. This competition generally occurs when the trees are small. Competing vegetation at this stage can be controlled with spacing saw or herbicides to protect your investment in a young stand. Woods road gated with a sign will inform people of your intensions. Protecting the resources on your woodlot from vandals and poachers can be difficult. This is especially true if you are an absentee woodlot owner. Trespassers can poach wildlife from your property, cause unnecessary damage to your roads, steal timber of Christmas trees and cause a fire hazard by smoking during the dry season. Any of these actions may decrease the value of your woodlot. Under the Protection Of Private Property Act, Nova Scotia woodlot owners have the right to prevent someone from entering your property. The only exception is the Angling Act which allows anyone to cross your property to gain access to their favorite fishing holes. In New Brunswick there are access laws for hunting, trapping, and motor vehicles, but there are no laws to prevent people from entering your property as long as they are not hunting or trapping. If someone is entering your property against your wishes, you can serve him notice that you want him to cease entering your property. If he doesn't stop, you can apply to the court to obtain a court order to prevent entrance to your property. Gates are another way to prevent vehicles from entering or damaging woodlot roads during wet times of the year. They are expensive to build and require maintenance to keep them working. Before erecting a gate consider the message you are sending to your neighbours who may use your woodlot for recreation. It is advisable to discuss the erection of a gate with neighbours and perhaps provide them with a key. A gate should be well marked with orange fluorescent paint and should be visible from a distance so that people will have a chance to stop their vehicle. You should also erect signs warning public of a gate's location. Without taking these precautions, you as the owner of the property may be liable. Signs such as "No Hunting" and "No Trespassing" can inform people of your wishes regarding access to your property. Again, if they continue to use the property against your wishes, you can serve them notice of your intent, and then proceed to the courts. Blowdown of trees from wind can reduce the value you have built into your woodlot. Blowdown can knock down trees in parts of stands or even a whole stand. Our native softwoods, with the exception of pines and hemlock, are more susceptible to blowdown than our native hardwoods because of their shallow rooting systems. Blowdown looks bad and can reduce woodlot value. Blowdown forces you to harvest the tree or stand at a time when it may not be convenient for you. As well, when trees are lying criss-crossed on the ground the cost of harvesting increases. Unless harvesting is carried out in the first year of the blowdown, the quality of the wood decreases. Through silviculture practices, the risk of blowdown can be minimized. By keeping your woodlot healthy and harvesting timber as it matures, the risk of blowdown can be reduced. Also, before thinning softwood give careful consideration to exposure from wind. Owning an asset such as a woodlot where the general public can travel, requires care to protect people from injury. Lack of responsibility could expose a woodlot owner to a civil liability suit if someone should hurt themselves when occupying your woodlot or if activities on your woodlot cause damage to another woodlot. Different levels of care are expected by society depending on who visits your woodlot. The level of care to protect a trespasser is no more then making sure that a trap is not set for them. Unfortunately, in an effort to limit access, a gate or chain may be seen as a trap depending on the effort made to make it visible to the trespasser. Therefore take care erecting a gate. The highest level of care has to be displayed when a person pays to use your woodlot. For example, make sure a broken branch dangling from a tree is cut before it injuries someone. A lower level of care is expected if a person is invited to use a woodlot but does not pay. For information on the level of care expected in your situation, you should seek the advice of a lawyer. As a rule of thumb, if you display due diligence and act as a reasonable person would act as you carry out your activities, it goes a long way toward protecting yourself in third party liability suits. As with visitors on the woodlot, a woodlot owner should be diligent in all activities. An activity such as burning could expose a woodlot owner to financial risk if the fire was to get away and damage a neighbour's property. The woodlot owner may be liable for the fire fighting costs and property damage. When using a contractor to carry out activities on the woodlot, it goes without saying that one should use a reputable contractor. However, it would be smart to ensure the contractor has liability insurance, fire fighting insurance, and has a letter of good standing from the Worker's Compensation Board. Even if you carry out all of your activities in a diligent way, you may also want to purchase General Liability Insurance to protect you from the unexpected accident. Liability insurance can be purchased for a reasonable premium. Premiums are calculated based on the degree of exposure. The underwriters will look at the activities on the woodlot and rate the premium accordingly.